Press Releases – Page 4 – OpenTech Alliance, Inc.
Strategic Storage Trust Expands Call Center with INSOMNIAC Live! PHOENIX, Arizona – October 12th, 2010 – Strategic Storage Trust, Inc. (SSTI) – a publicly registered non-traded REIT targeting the self storage market – recently selected OpenTech Alliance’s INSOMIAC Live! to handle its growing call center operations. OpenTech is a leading developer of innovative solutions that help self storage business owners extend their business hours. INSOMNIAC Live! will handle calls received after normal business hours and surplus calls for the national self storage operator that offers a portfolio with 57 facilities spanning 16 states under the SmartStop SM brand. OpenTech’s LiveAgent! technology platform will access SSTI’s property management system and other information such as Google mapping and directions, competitive differentiators and more. About Strategic Storage Trust, Inc.
SSTI is a publicly registered ($1 billion of common stock registered) non-traded REIT with a portfolio that currently includes approximately 24,500 self storage units and 3.0 million rentable square feet of storage space. SSTI’s sponsor is Strategic Capital Holdings, which manages a growing portfolio of over 6.3 million square feet of commercial properties, including 4.9 million square feet of self storage facilities, with a combined market value of over $685 million. For more information about SSTI, please call 949-429-6600 or visit www.strategicstoragetrust.com. OpenTech Alliance, Inc. is the leading developer of innovative self-storage solutions. The company products and services include 7 models of INSOMNIAC Kiosks ranging from $4,900 to $18,000, INSOMNIAC Live! call center services and the INSOMNIAC Self Storage Network for online storage reservations. OpenTech products and services improve customer convenience, reduce operating costs and increase revenues for self-storage facilities. For more information or to see an online demo, please visit www.opentechalliance.com or call (602) 749-9370. 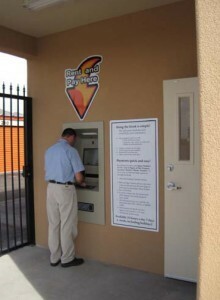 PHOENIX, Arizona – October 8th, 2010 – OpenTech Alliance is proud to announce that Almighty Self Storage rented 17 units in the month of August through their INSOMNIAC kiosk. Brian Vander Meulen, owner of I.D.E.A.L. 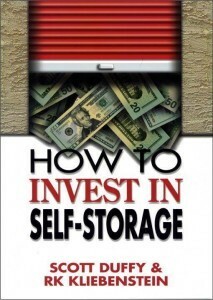 Assets, LLC and creator of the Almighty Self Storage brand, began consulting in 2006. In July 2009, his company was hired to turn around and manage a self storage facility. One of the first things Vander Meulen did was advise his client to install a self–service kiosk to extend the facilities’ business hours, make it more convenient for customers and easier for him to manage. One of the unique things about the kiosk is that customers pay late fees. People cant argue with the kiosk about why their rent is late, they just pay it, commented Brian Vander Meulen, owner of I.D.E.A.L. Assets, LLC. The kiosk was installed right before Thanksgiving in November 2009 and the first two move-ins actually took place on Thanksgiving Day. 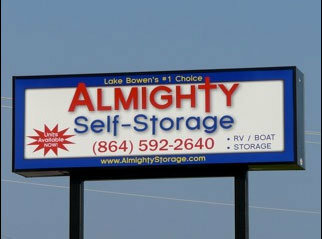 Almighty Self Storage is located in Inman, South Carolina – a small town of approximately 2,100 people situated near Lake Bowen. The facility has approximately 280 units and is fully fenced with upgraded electronic access and a new digital video monitoring system. Vander Meulen also advised his client to convert some unused office space into new climate-controlled units (which are completely rented) as well as add a new RV building which includes 12 additional covered boat/RV spaces in order to accommodate the growing demand for those rentals. Now, along with its non-climate controlled units, the facility has been upgraded to better serve the customer demand of the local Lake Bowen market. The nearest competitor is less than one half mile away making competition very tight. Implementing the kiosk was a crucial decision for Vander Meulen. “I was going through a difficult personal time with my infant daughter’s health and had to manage the facility from out of town, without the kiosk that would not have been possible.” Vander Meulen was able to automate the facility to the point that he could effectively manage the business via the phone, internet, and kiosk. Primarily through the addition of the kiosk as well as other facility upgrades, Vander Meulen was able to increase rental rates and decrease delinquencies – resulting in a $3,000-$4,000 a month increase in revenue. “The kiosk has been a tremendous help with move-ins, especially with the convenience it provides after hours.” commented Vander Meulen. “Customers have realized how easy it is to use. The kiosk has been averaging anywhere from 30 to 50 payments per month and last month the kiosk rented 17 units. One of the unique things about the kiosk is that customers pay late fees. People can’t argue with the kiosk about why their rent is late,” said Vander Meulen. “They just pay it.” This benefit alone has allowed Vander Meulen to have better control of the facilities late-paying customers; therefore, being able to essentially run the facility with a one to three percent delinquency rate. Vander Meulen also added, that primarily due to the addition of the kiosk, as well as the other facility upgrades, he was able to increase the rental rates and decrease delinquencies resulting in his client’s overall increased revenue by about $3,000 to $4,000 per month. Clients have told Vander Meulen that their customers may not like the kiosk or may not adapt to its advanced technology. “I just tell my clients – this is a must have – if people can use an ATM, they can use the kiosk.” With occupancy rates that have increased nearly 20 percent, Vander Meulen is confident in his advice. .D.E.A.L. Assets, LLC offers self-storage management, property valuation, image consulting as well as bookkeeping services. 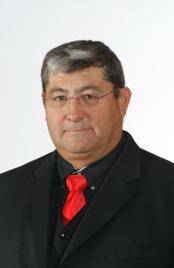 To allow Mr. Vander Meulen and his team to assist you in making your facility look better and run smoother while increasing your bottom line, contact him for a confidential consultation via phone at (864) 529-8494 or e-mail at brian@ideal-assets.com. PHOENIX, Arizona – September 14, 2010– OpenTech Alliance, Inc. today announced it has exceeded the 38 million dollar mark in rental fees collected by its INSOMNIAC kiosks at their client’s self storage facilities across North America, with over $9M of that amount being collected in the first half of 2010. In their ongoing effort to be a transparent company, OpenTech is releasing these detailed kiosk usage numbers for the first six months of 2010 and will publish the 2010 Kiosk Usage White Paper early next year. This level of transparency gives the self storage industry the opportunity to see how consumers are adopting the self service channel. This trend towards self service should come as no surprise since consumers by the millions are opting to make purchases over the internet instead of face to face with a human. “INSOMNIAC kiosks can serve as a hedge against increasing expenses in this tough economic climate. The kiosks give self storage owners the ability to reduce their staffing expense without sacrificing customer service” said Robert Chiti President and CEO of OpenTech Alliance. For the first half of 2010, 47% of moves-ins and payments took place outside of office hours. This proves there is a tremendous opportunity for storage owners to acquire more customers by being open for business outside of regular office hours. The other 53% of kiosk usage occurred during regular office hours. This clearly shows the kiosks complement on-site managers and demonstrates that customers are comfortable using self-service technology. Credit cards are the preferred method of payments at the kiosk. 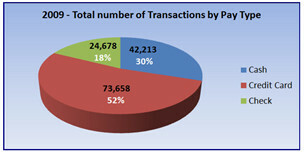 However, the use of cash and checks represents 48% in total payments made at the kiosk. With all three forms being used a great deal the need for providing consumers with an on premise payment system that supports all three forms of payment is a must. OpenTech Alliance, Inc. is the leading developer of innovative solutions for the self storage industry. The company’s products and services include seven models of INSOMNIAC Kiosks ranging from $4,900 to $18,000, INSOMNIAC Live! call center services and the INSOMNIAC Self Storage Network for online storage reservations. OpenTech solutions improve customer convenience, reduce operating costs and increase revenues for self-storage operators. For more information please visit www.opentechalliance.com or call (602) 749-9370. 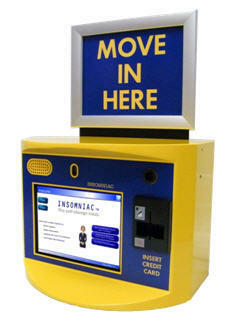 Managing INSOMNIAC Kiosks just got easier and more efficient! PHOENIX, Arizona – August 31, 2010 – OpenTech announced that they are launching the company’s new ISeries™ kiosk management services at the Self Storage Association’s Fall Conference and Tradeshow in Las Vegas this week (Booth 315,317,319 & 321). The ISeries will now be available to all customers on the Maintenance and Warranty Services (MWS) program at no additional charge. The ISeries Services include IReplay™, IMobile™, and IRemote™. These new services make it simple for self storage operators to manage their business more effectively from virtually anywhere they have internet or cellular service. “We feel the financial pain self storage operators are going through, so we are doing our part by continuing to deliver new innovative solutions to our customers without increasing their costs,” stated Robert A. Chiti, President and CEO of OpenTech Alliance, Inc.
IReplay – allows self storage operators to do something they don’t even do at their counter – see and hear the interaction and experience their customers have when renting a unit or making a payment. When a customer uses a kiosk, their entire transaction is recorded and stored for review. The kiosk records the screens as well as the customer and compiles it with the information entered into the kiosk. The IReplay of the transaction is accessed through the online reporting system and can even be shared with others via email. “We have 5 INSOMNIAC kiosks, and we are evaluating them to see if we can use them at more of our facilities. The IReplay capability allows us to see, listen and learn what our customers are doing at our kiosks, and it is helping us understand what changes we can make to the kiosk configuration and our operations to make the rental process easier,” said Meisha Wilson, Vice President for Hide-Away Storage. IMobile – allows busy self storage operators to use their phone to manage their business. Self storage operators can view kiosk transaction reports (including IReplays on phones that support Flash), see when new units are rented or payments are made, change settings, contact OpenTech technical support and even control the kiosk in real-time using IRemote. With IMobile, managers and owners that cannot be at their property or in front of a computer all of the time can still manage their business as if they were there. “I am on the road visiting facilities constantly. IMobile has made it much easier for me to keep track of how our facilities are performing, no matter where I am, without having to boot up my laptop. I use it regularly to get the information I need quickly”, explained Ryan Rogers, Vice President for Dahn Corporation. IRemote – allows self storage operators to help a customer while he or she is standing at the kiosk. Sometimes customers get stuck during a transaction (typically trying to login to make a payment). IRemote gives operators the ability to see the transaction and where the customer is having difficulty. Operators are then able to take control of the kiosk and enter the needed data – adding a whole new dimension to customer service. “As part of our Live! Megan service, which is included in the MWS program at no charge, we receive calls from customers standing at the kiosk. The IRemote service allows our agents to assist customers and walk them through a rental quickly and efficiently. It is fun to hear their amazement when we remotely control the kiosk as we talk with them,” commented Cynthia Abraham, Vice President of OpenTech Alliance and General Manager of the INSOMNIAC Live! Call Center. PHOENIX, Arizona – August 27th, 2010 – OpenTech Alliance is pleased to announce that Staunton Self Storage in Staunton, Virginia is experiencing the real operational effectiveness and convenience the INSOMNIAC AssistantManager – Megan offers self storage operators. “If you think something small can’t make a difference, try sleeping with a mosquito in the room” reads the tagline at the bottom of Staunton Self Storage owner Troy Rutherford’s email. Rutherford considers the kiosk and the call center a “small thing” that made a huge difference at his facility. I only have one manager assigned to oversee the entire facility which started with 150 units and has grown to a whopping 525 units. Megan has helped make that possible, said Rutherford. Prior to Megan, Rutherfords manager used to spend at least a half day, every day managing the facility. Now the manager barely spends an hour a day managing the same property and can better utilize his time on other businesses. “The kiosk and the call center (Megan) have allowed me to add more units without increasing the amount of money and time required to manage the facility – it’s brilliant,” said Rutherford. Rutherford is impressed with the customer convenience that the kiosk and call center adds. “It’s always there, always working and it’s affordable,” said Rutherford. Recently, Rutherford experienced firsthand how valuable Megan was when his manager forgot to remove an overlock. The customer pushed the help button on the kiosk and was immediately connected to the call center who contacted the manager and Rutherford to get the overlock removed. The situation was quickly remedied and the customer even commented on how great it was that Megan was there to assist them. “Without Megan, we would have had one angry customer – because it was after hours,” added Rutherford. 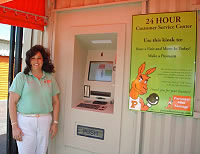 PHOENIX, Arizona – August 18th, 2010 – OpenTech is pleased to announce that Dave Morris, owner of Viking Storage and 24/7 Storage in Idaho is realizing the savings a kiosk is bringing to his businesses. Morris started his venture into self storage less than two years ago with 24/7 Storage in Nampa, Idaho, a facility that was built in 1985. The facility had no security or gates – just an 80 year-old lady that lived in a trailer on the property with several dogs and took customers by appointment. It was run down, said Morris. I bought it, painted it and installed some modern technology. As a contract pilot on Gulfstream 550s that fly all around the world, Morris knew that this facility needed to be automated. So, he added gates, security cameras and a kiosk. “It’s phenomenal,” said Morris. “I can monitor everything while I’m on the road.” In one year, Morris nearly doubled the facility’s occupancy rate to 85 percent. “I’ve had zero break-ins because of the signage and the cameras and let’s face it – how much security is an 80-year-old lady going to provide?” he added. 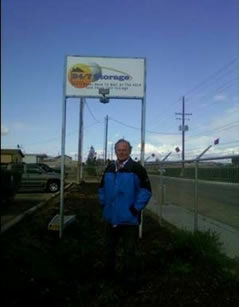 His early success encouraged him to invest again, and he added Viking Storage in Middleton, Idaho. Because the Middleton facility was only four years old, the only upgrade that was needed this time was the kiosk. The occupancy has jumped to 65 percent in just a short amount of time. Morris averages 20 new renters per month and rarely needs to step foot onto the property. “This is the perfect set up for me,” said Morris. “I don’t have employees and I rarely have to talk to customers. And – Megan is nice. Customers are no longer at the mercy of the dog lady,” he added. The kiosk also has helped Morris bridge the gap with his Spanish-speaking customers. “I don’t speak Spanish – and I lost business because of that – now, the kiosk answers all the questions,” said Morris. Morris estimates that he has saved nearly $40,000 per year through this technology and by not utilizing the yellow pages for advertising. “Customers tend to rent in a four to five mile radius,” said Morris. “Why would I pay for advertising coverage that reaches people who will never rent from me?” He figures that he would have to rent eight units full time all year long to pay for the ads, so Morris prefers to get exposure through good community relations. Most recently, he purchased new sneakers for the local high school’s girls’ and boys’ basketball teams. OpenTech Alliance, Inc. is the leading developer of innovative self-storage solutions. The company products and services include 6 models of INSOMNIAC Kiosks ranging from $4,900 to $18,000, INSOMNIAC Live! call center services and the INSOMNIAC Self Storage Network for online storage reservations. OpenTech products and services improve customer convenience, reduce operating costs and increase revenues for self-storage facilities. For more information or to see an online demo, please visit www.opentechalliance.com or call (602) 749-9370. 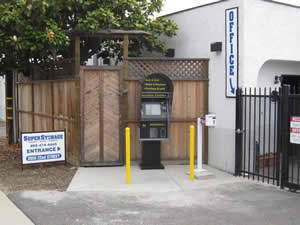 PHOENIX, Arizona – July 16, 2010 – OpenTech is pleased to announce that SuperStorage and Main Mini Storage, divisions of Network Storage Capital Inc., with headquarters in San Diego, California, has added kiosks to their facilities to help give their managers a competitive advantage. “I’d been thinking about purchasing a kiosk for quite some time,” said John McGrath, President of Network Storage Capital, Inc. After a presentation from another OpenTech customer, McGrath realized how a kiosk could streamline his operations through better accounting, security and improve the overall functionality of his sites. He then explained it plain and simple – “If I asked you to cut down a tree – would you want an axe or a chainsaw?” Once managers understood McGrath’s intentions they were onboard and actually excited when the kiosk arrived. To further improve the return on his investment, McGrath requires his managers to introduce all new customers to the kiosk and ensure current customers know that it is there and ready to serve them. 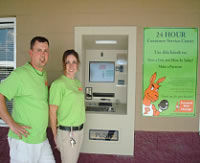 In fact, McGrath’s managers even receive an incentive for the amount of business that is done on their facility’s kiosk. McGrath believes that the role of the self storage manager is changing. “In the late 80s it was a classic retired couple and as the industry matured in the 90s, things became more sophisticated, bigger and definitely more competitive requiring an advanced skill set from managers,” said McGrath. “My primary reason for purchasing the kiosks was to leverage up my managers’ productivity, not only by streamlining operations, but to cover more facilities/units and capture after hours business. It also allows managers to leave the office to promote the site,” said McGrath. Initially, Network Storage Capital did realize some implementation barriers as a QuikStor software user since the interfaces between QuikStor and OpenTech were not yet integrated. McGrath and his team are now the beta testers for the interface, paving the way for all other QuikStor customers. “Representatives from OpenTech and Quikstor have been amazing about the amount of resources they have allocated to ensure that any issues I have are addressed quickly and efficiently – I’m very impressed,” said McGrath. The implementation of the kiosks has allowed McGrath’s customers another way of doing business at his facilities – giving Network Storage Capital a tremendous competitive advantage. With an industry that is becoming increasingly competitive, McGrath has found a way to deliver state of the art tools to his management team –helping them become more effective and productive. To learn more about these companies, visit their web sites at http://www.ineedsuperstorage.com and www.QuikStor.com. PHOENIX, Arizona – June 30th, 2010 – OpenTech announced today that E-SoftSys has become the newest member of their Alliance Partner Program. The two companies have been working together for the past few months to develop a seamless integration between E-SoftSys’s property management software, Self Storage Manager, and OpenTech’s products; the INSOMNIAC Kiosk, INSOMNIAC LiveAgent! call center application and the INSOMNIAC Self Storage Network. PHOENIX, Arizona – June 22nd, 2010 – OpenTech announced today that Smart Storage Concepts, a subsidiary of Smart Marketing Concepts, Inc. has become the newest Marketing Partner to join the INSOMNIAC Self Storage Network (ISSN). Smart Storage Concepts has developed a simple to use yet sophisticated real-time reservations engine that self storage operators can embed in their website to allow consumers to quickly reserve units or make payments. 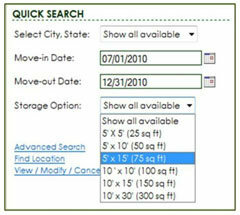 Smart Storage Concepts is also using the same reservation technology to power their new USavestorage.com portal. USavestorage.com is where independent self storage operators can sign up to be the only self storage facility in their area to be on the site and they won’t be crowded out by the big guys. “The addition of Smart Storage Concepts to our online reservations network brings a whole new level of convenience to the self storage operator and consumer” said Robert Chiti, President and CEO of OpenTech Alliance. Smart Storage Concepts is a provider of affordable reservations technology and internet marketing strategies for small to mid-size self storage operators. The collaborative partnership with OpenTech integrates Smart Storage Concept’s intelligent Centralized Reservations System (CRS) with many of the industry’s long established property management systems providing a whole new level of efficiency in leveraging real-time rate and revenue management allowing instant generation of customer confirmations. At this time, a showcase of the system is set up for the self storage industry to make (test) real-time reservations and receive instant confirmations through June 30th. Click the image to the left to make a test reservation. ISSN was developed so self storage operators can easily market their available inventory of empty units through third party marketing companies on a secure, real-time network without requiring self storage managers to spend hours keeping different systems updated with inventory and pricing changes. Consumers get a confirmed reservation or rental similar to the way they purchase an airline ticket on Orbitz.com or reserve a hotel room on Hotels.com. When a consumer makes a reservation through the website of an ISSN Marketing Partner it is stored directly in the facilities’ property management software, no emails or faxes to misplace. OpenTech does not currently charge a fee for self storage operators to join the network and an INSOMNIAC kiosk is not required. Headquartered in Oldsmar, Florida, Smart Marketing Concepts, Inc. (smartmarketingconcepts.com) was formed in 2003 to provide its clients with a private labeled version of intelligent reservations technology and Internet marketing services. Smart Marketing Concepts has, with its teams 55 years of combined experience in reservations (airlines, hotel, car rental, parking and global distribution) and other transactional businesses (convention bureaus, call center operations, ticketing, and finance), developed a strong reputation for creating evolutionary solutions for a wide range of industries. Smart Marketing Concepts’ proprietary, patent-pending centralized reservations system has been designed from the ground up to deliver the most relevant, location-based pricing on products or services to consumers while providing real-time data and analytics for store owners to make timely decisions. To get ‘smart’ technology working for you 24/7, please call our sales department toll-free at (800) 385-1658. Wilson hits the talk button and immediately gets down to discussing business. On the other end is the maintenance supervisor for Hide-Away Storage who wants to go over landscaping bills and other operation costs with Wilson, the company’s chief executive officer. “That’ll save us about $1,000 in tree trimming right there,” Wilson says. These types of conversations are common for the businessman these days. Given the economic conditions, Wilson is doing all he can to save money at his self-storage company, based in Manatee County. In some cases, that meant having to lay off employees. In other cases, it meant looking at cost-saving measures as tedious as switching the exterior lights at all 10 of his storage facilities in Bradenton, Ellenton, Sarasota, St. Petersburg, Fort Myers and Naples. Like many business owners in this recession, Wilson has watched Hide-Away Storage’s gross revenue shrink over the past couple years. “In ’06, ’05, we were headed toward revenue of about $15 million,” Wilson said. Last year, gross revenue was $8.9 million. “We’ve been very badly hurt,” he said. The storage industry has been one of the fastest-growing industries in commercial real estate during the past 35 years, according to the Self Storage Association. The trade association, based in Arlington, Va., estimates there are 46,000 self-storage companies in the United States with total sales of more than $22 billion in 2009. From 2004-05, the storage industry was saturated with company start-ups. There were 6,034 new storage facilities built that year, Self Storage Association data show. The excessive inventory has hit the self-storage industry particularly hard given the sharp decline in demand because of slow housing sales. Last April, the industry saw one of its worst months when nationwide self-storage rentals declined 30 percent, according to UBS Investment Research. 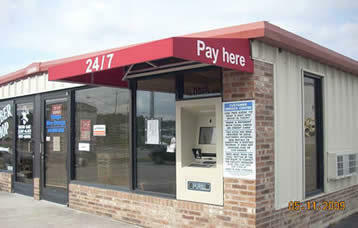 PAUL VIDELA/pvidela@bradenton.com Hide-Away Storage’s 24-hour automated kiosk is similar in appearance to an ATM, and allows customers to rent out space after regular business hours, eliminating the need for an on-duty manager to work extended hours or on Sundays. Next month, Hide-Away will open a new storage facility on Fruitville Road that will be solely operated by a 24-hour kiosk. 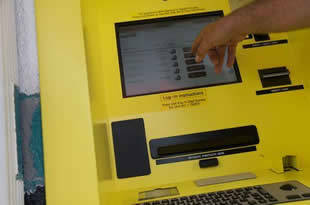 The 24-hour kiosks already have been installed at Hide-Away facilities in Ellenton and Bradenton. Those facilities will maintain a manager on site during regular business hours. 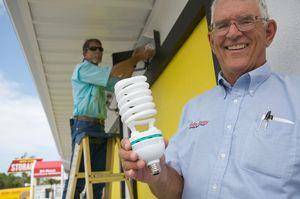 PAUL VIDELA/pvidela@bradenton.com Steve Wilson, right, chief executive officer of Hide-Away Storage, holds a large, 65-watt compact fluorescent bulb, which will soon replace hundreds of 275-watt metal halide bulbs in fixtures throughout Hide-Away’s 10 storage facilities. It’s one step in an overall energy-savings plan. On the ladder at left is Jimmy Langead, of Goodson Electric of Palmetto, which is helping to rewire the existing light fixtures to accommodate the compact bulbs. Travis Lawhorne, president of Accountable Management and Realty, doesn’t see it becoming an industry trend — at least not for clients of his Lutz-based storage management and consulting firm. Lawhorne doesn’t believe there is enough demand for late-night rentals to support the investment of 24/7 kiosks. But Bradenton resident Ida Edwards says she likes the idea of anytime-access to storage or rentals. 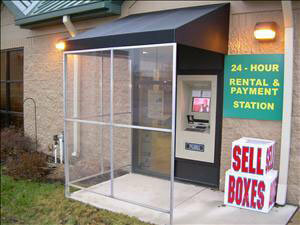 Edwards used a 24/7 kiosk at a Hide-Away facility at 8400 Cortez Road to rent storage space after hours. The late-night hour was a more convenient time for her and her husband to move their belongings. Due to the recession, Wilson has downsized his staff from about 70 employees three years ago to 45. From 2008 to 2009, revenue declined $1.1 million, but Hide-Away saved $1.4 million in operation expenses. Now, Wilson is looking for other areas to cut costs — and that includes going green. Hide-Away Storage is in the process of converting exterior lights from metal halide bulbs to compact fluorescent lights at all 10 locations. Wilson estimates the changeover will save him about $40 a bulb per year. With about 40 bulbs at each Hide-Away facility, Wilson will save about 75 percent on his lighting costs. PHOENIX, Arizona – May 24, 2010 – OpenTech is pleased to announce that Castlerock Self Storage is running an unmanned self storage facility. Castlerock Self Storage is a subsidiary of the Sentry Management Corporation, owned by Mark Shearholdt. Shearholdt is new to the self storage industry with his property management business occupying most of his time. Like many other property management companies, Shearholdt had an opportunity to make an investment in self storage and took it. Self-storage owners nationwide are holding on in this tight economy, but to do so is no small feat. Infinite Self Storage is one clear example of how a company can thrive in a downturn. In a world filled with automation and consumers who want what they want when they want it, Steve Lavery, vice president of property management at Herman and Kittle Properties, knew something had to change to keep business booming. 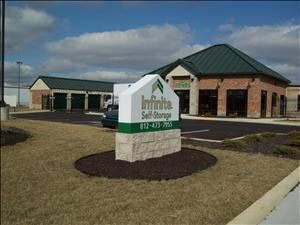 A subsidiary of Herman and Kittle, Infinite Self Storage is comprised of 23 properties throughout Illinois and Indiana. From its headquarters in Indianapolis, the company operates more than 1.2 million square feet of storage space and more than 6,400 apartment homes in six states. In 2007, Infinite began to change the face of its business, creating greater coverage and meeting the demands of a customer base that wants 24/7 service. The first step was installing four self-service kiosks to allow customers to rent units and make payments on their own schedule. When those kiosks rented 40 units in the first three months of operation, the management team became believers. In 2008, the company installed 19 more kiosks and, in 2009, it signed up for a call-center service to take advantage of two key services. First, the call center pushed all calls not answered at a facility to a call-center agent who could give the caller information or make a reservation. Next, the agent directed the customer to the kiosk and walked him through the entire rental process, making the sale complete. Infinite also considered the potential security issues of granting immediate access to customers who rent using the kiosk. Security cameras are in place and management has knowledge of customers accessing units based on gate code. In assessing the risks and rewards, Lavery calculated that if each store generated two kiosk sales per month, the units would pay for themselves. On average, the kiosks are generating six sales per month, tripling Lavery’s expectations and providing a clear sign that customers are responding to the technology. With confirmation of results, Infinite eliminated the assistant-manager position from its organizational structure, saving $200,000 annually. “We’re getting 100 hours of coverage per month with the call center for about a dollar an hour,” Lavery says. He believes there are four crucial components to making this model work. The first is an Internet presence that lets customers know you are open 24 hours, seven days a week. This helps drive traffic to your facility. Next is a kiosk that allows customers to rent and make payments at their convenience. The third component is the call center, which enables managers to focus on marketing. And last, but still a crucial key to success, is marketing your services in the community. Lavery’s team leaders spend anywhere from two to four weeks training new store managers. It’s a well-defined program that teaches a variety of skills including marketing and sales calls. Infinite’s managers all use Blackberries and have access to facility information via their home computers. Infinite is currently testing two operational models: one manager running two stores, and one manager running three stores. The first model has been going strong since it began in November and has allowed Infinite to realize savings of approximately $35,000. The second model was initiated in February 2010, so it’s too early in the process to make a determination on gains. Lavery indicated that one small downside to this model is the toll it can take on employee engagement. “Initially, our managers had a lot of resistance to this type of model and the technology that goes with it,” he says. With the kiosks now handling 35 percent of new sales, Lavery and his team have time to market their facilities in the community while attending to employee engagement. They also have time to think about what’s next. Ideas range from automated accounts receivable to systems that use voicemails and e-mails to contact customers regarding their accounts. Lavery estimates 40 percent of his customers list an e-mail address as a method for contact. “It’s just another sign that people are embracing technology and prefer it,” he says. Additionally, Lavery indicated that Infinite knows this technology template will work, and feels the company can experience success on the acquisition side of the business using this model. When implementing a model like this, Lavery recommends self-storage owners reach out to operators who are already embracing technology. Infinite Self Storage is not only holding steadfast in a tough economy but experiencing growth and increased revenue. The company’s willingness to invest in technology and evolve its property-management model to meet customer demands has been very rewarding. Mandy Welborn is the marketing manager for OpenTech Alliance Inc., maker of the INSOMNIAC line of self-storage kiosks. For more information, call 602.749.9370; e-mail mwelborn@opentechalliance.com, visit www.opentechalliance.com. PHOENIX, Arizona – March 25, 2010 – OpenTech Alliance announced today that their INSOMNIAC Live! call center has been selected by several leading self storage operators (including Chesapeake Resources, Watson & Taylor, Infinite Self Storage, Professional Self Storage Management, San Diego Self Storage, Southern Self Storage, Saf-Keep Storage and more) to assist their managers in renting units, processing payments, and servicing customers. The INSOMNIAC Live! call center services self storage operators with or without a kiosk. Sarasota, FL (PRWEB) March 16, 2010 — Construction is underway on a new type of self-storage facility on Fruitville Road east of I-75 where customers will be able to rent any of the 370 storage spaces or make rent payments day or night using a ‘kiosk” located at the facility, the developer says. Self-storage owners will now get more bang for their buck with OpenTech’s expanded Maintenance and Warranty Services (MWS) program that offers the new Live! Megan service at no additional charge. With the Live! Megan service, kiosk users get assistance from a live call center agent when using an INSOMNIAC kiosk to rent a unit or make a payment. 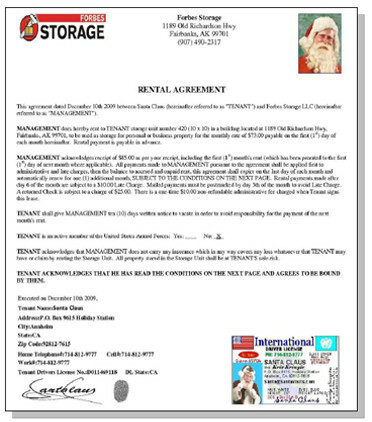 PHOENIX, Arizona – December 17th, 2009 – OpenTech Alliance, Inc. announced today it has proof Santa is a self storage user (see rental agreement below). On Thursday December 10th, a little after dark, a man named Kris Kringle rented a self storage unit at Forbes Self Storage in his home town of North Pole, Alaska. Santa, as he is commonly known, showed up at the new facility after the office had closed and was very jolly to see an INSOMNIAC self service kiosk installed for his convenience. In just a few short minutes Megan, the on screen assistant, helped him complete the rental process so his elves could start stacking presents in the unit. Kids everywhere will be happy to know that Santa has so many presents to deliver this year that he needed some extra storage space. Forbes Storage is owned by Buzz Otis and Renee Webb Otis, who were recently featured on the cover of the Self Storage Association’s Globe magazine. They operate two facilities in North Pole, Alaska; an existing facility which they purchased in 2002 and the new 15,000 sq. ft. annex facility which they built eight miles west of their first facility. The annex facility is run primarily with the kiosk. Since installing the INSOMNIAC 900 at their new annex facility in late October it has rented 20 units. OpenTech Alliance, Inc. is the leading developer of innovative self-storage solutions. The company products and services include 6 models of INSOMNIAC Kiosks ranging from $9,000 to $18,000, INSOMNIAC Live! call center services and the INSOMNIAC Self Storage Network for online storage reservations. OpenTech products and services improve customer convenience, reduce operating costs and increase revenues for self-storage facilities. For more information or to see an online demo, please visit www.opentechalliance.com or call (602) 749-9370. PHOENIX, Arizona – December, 9th 2009 – OpenTech Alliance, Inc. announced today that Village Mini Storage in North Carolina is saving over $2,100 per month as a result of implementing an INSOMNIAC 900 at their facility. During the first 7 months the kiosk was installed it rented 30 units and processed 258 payments for a total $20,525 in revenue. In addition, Village Mini Storage also reported a 30% reduction in the amount of delinquent customers, which the owner attributes to the fact that the kiosk takes away many of the excuses customers use for not paying their rent on time. Tony Martin, owner of Village Mini Storage (150 units) and Martin Mini Storage (259 units) in Rockingham, NC traditionally operated his facilities with a total of 5 employees. Recently he was notified by one of his employees (a relative) that they were planning to leave the company. With one of his key employees leaving and the economy being uncertain, he decided to rethink how he manages his facilities. His primary objective was to find a way to operate his facilities more effectively without compromising customer service. Tony installed an INSOMNIAC 900 (pictured below) and is now operating both of his facilities with only 2 full time managers and provides his customer with 24/7 service. Tony understands the value his customers put on convenience and feel his self service kiosk offers them the freedom to do business when it best suits them. He has also implemented all the kiosk success Best Practices including ample signage, installation of the kiosk near the front door, and leaving the lights on in his office to attract evening drive by prospects. PHOENIX, Arizona – October 19th, 2009 – OpenTech Alliance, Inc. announced today that The Caster Group has ordered their first 4 INSOMNIAC 900 kiosks. The Caster Group is one of California’s oldest and most respected self storage companies with over 40 facilities primarily in urban locations throughout California. 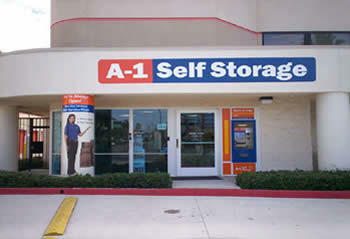 Their Class A facilities, branded A-1 Self Storage, range in size from 56,000 to 220,000 sq. ft. and include; indoor, outdoor and climate controlled units. They pride themselves on their superior customer service and with the addition of INSOMNIAC self service kiosks they will now be promoting “We are Always Open” convenience as part of their company’s brand. The kiosks are being installed at the following locations; Kearny Mesa – a community in the eastern part of San Diego, La Habra – in northern Orange County, Cypress – in western Orange County, and San Jose. The Caster Group is implementing OpenTech’s best practices as outlined in the Kiosk Success Guide, including; positioning the kiosk next to the front door of their office, creating high visibility signage highlighting the new amenity, and working with their on-site managers to ensure they are trained on how to use and promote the kiosk. They have integrated the kiosk with their companies call center so that when customers arrive at the facility (when the office is closed) they can talk with a live person if they need assistance in renting a unit or making a payment at the kiosk. Call center agents are also capable of viewing the person in front of the kiosk as well as taking control of the kiosk remotely if needed. In addition, customers will soon be able to reserve a unit from the companys website and complete the rental at the kiosk. Can you find the kiosk in this photo? The Caster Group’s commitment to marketing is not limited to the outside of facility. They also designed a very unique vinyl wrap for the backend of their kiosks. 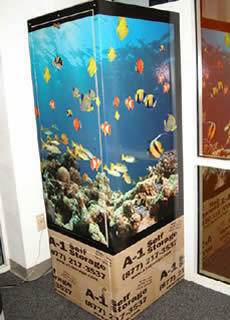 Their new tropical fish aquarium makes the kiosk a topic of discussion for everyone that enters the store. PHOENIX, Arizona – September 28, 2009 – Today OpenTech Alliance, Inc, announced that Barth Storage of Kenosha, Wisconsin has installed their first INSOMNIAC 770. During the past 5 months they have rented 60 units and processed 536 payments for a total of $59,476. Barth Storage has been a family owned and operated business for 3 decades. Ron and Kathy Barth started the business and eventually their three daughters Lisa Barth-Chiappetta, Chris Soto, and Debbie Wolf joined them. They built Kenosha’s first self storage property and now operate 3 properties in the area. The Barth Storage facility where the kiosk is installed has 675 units, office hours of Monday through Saturday from 8:30am to 5:30pm, and an on-site manager. The manager rarely rents units at the office counter instead she walks each new prospect to the kiosk and lets them move through the rental process at their own pace. Typically the process is finished in much less time than it takes to complete the paperwork at the counter. The self service kiosk provides consumers the freedom to compare units and pricing without having to ask the manager lots of questions, so they feel more in control and do not get intimidated or embarrassed. Barth also requires all cash transactions go through the kiosk which has eliminated any disputes related to cash payments being left in a drop box or with the manager. With the kiosk recording all cash that comes into the facility the chance for internal theft is eliminated as well. Click here to view Lisa talk about the kiosk in her own words. The kiosk is conveniently located outside the front door in a glass vestibule which keeps the kiosk users warm and dry during Wisconsin winter weather. When someone approaches the front door, Megan the animated on screen assistant, greets the customer in either English or Spanish and helps them rent a unit or make a payment. Customers can pay their rent 24 hours a day with cash, check, or credit card and they are always offered a receipt either printed or emailed to them. PHOENIX, Arizona – June 25th, 2009 – OpenTech Alliance, Inc. announced they have launched the industry’s only real-time self storage reservations network – the INSOMNIAC Self Storage Network (ISSN). ISSN will allow self storage operators to get online reservations through multiple sales channels and their property managers no longer have to waste time updating their available unit information in several different systems. Also they no longer have to play phone tag trying to connect with consumers who requested a quote. Regardless of if a self storage operator has an INSOMNIAC kiosk or not, they can join ISSN and start using the internet like it was meant to be – in real-time! PHOENIX, Arizona – April 24, 2009 – OpenTech Alliance, Inc. today announced the new upgraded INSOMNIAC 300, which sells for $9,000, will now rent units and process payments 24 hours a day. In a time when every self storage owner is struggling to find ways to cut costs and rent more units, OpenTech makes it even easier to do both. The 300 is perfect for large facilities that employ part-time or relief managers just to handle customer payments and for small facilities that can no longer afford to have a manager on duty 8 hours a day. The INSOMNIAC 300 is a freestanding kiosk that will accept checks, cash and credit cards, and comes with “Megan” the on-screen assistant who walks your customers through the rental or payment process in English as well as Spanish. Now renters can also sign their rental documents with the latest in on-screen touch technology and have the option of having the documents emailed to them or provided by the property manager when the office is open. The new 300 could be the difference between being profitable or losing money for many self storage owners this year. As traffic at a facility slows and the occupancy sinks, owners have the choice of continuing to pay for someone to sit in the office for 8 – 10 hours a day, at $12 per hour, or make a minimal investment in a self service solution that will work all day for that same $12. 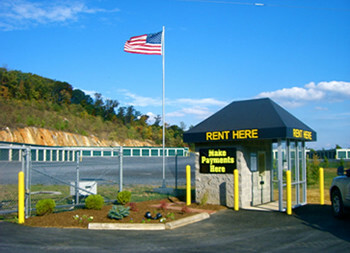 And with new special leasing terms self storage owners can pay as the save without any large upfront costs. OpenTech Alliance, Inc. is the leading developer of self-storage kiosks. OpenTech’s patented INSOMNIAC kiosks enable consumers to rent units, make payments, purchase locks, and update their accounts on their own without a manager’s assistance. For more information about OpenTech, please visit www.opentechalliance.com or call (602) 749-9370. PHOENIX, Arizona – March 16, 2010– OpenTech Alliance, Inc. announced today that it has exceeded the $29 million mark in rental fees collected by its INSOMNIAC kiosks. 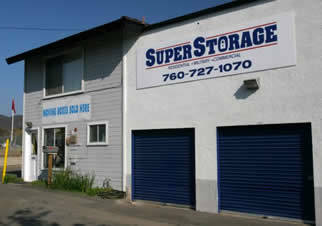 Approximately $13 million was realized in 2009 by self storage operators throughout the U.S. and Canada. In an ongoing effort to be a transparent company, OpenTech has released these detailed kiosk usage numbers giving the self storage industry the opportunity to see firsthand how much consumers have utilized and benefited from the use of self service kiosks. The complete 2009 Kiosk Usage White Paper is available for down load at the company website. “The more data available to self storage operators, the better they are equipped to make critical decisions about running their business. OpenTech’s commitment to transparency is a positive thing for the self storage industry,” commented Charles Ray Wilson, President of Self Storage Data Services, Inc.
OpenTech reported 311 kiosks were online as of January 1, 2009 and another 208 were added in 2009. During 2009, consumers used INSOMNIAC kiosks to rent 11,951storage units, make 122,313 payments, and purchase 6,305 locks representing a total of $13.3 million in self service transactions. 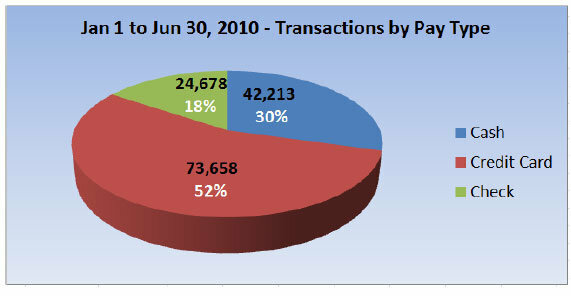 The two charts below illustrate the transactions of new rentals and payments made throughout 2009. OpenTech’s kiosks never take a day off, a huge benefit for customers needing to rent a unit or make a payment on a holiday. 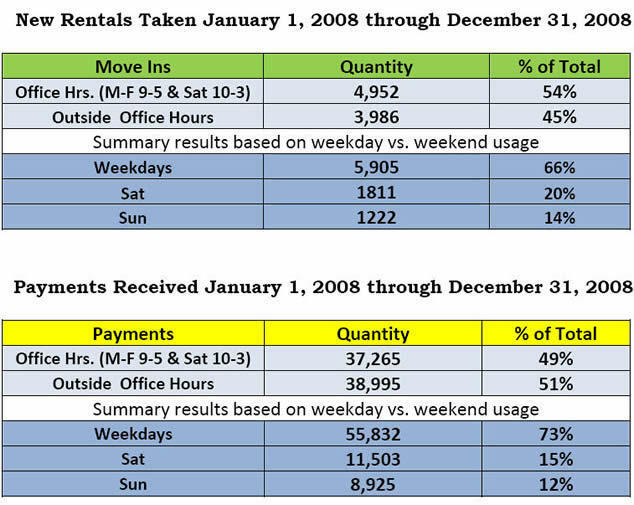 In 2009, INSOMNIAC kiosks rented 297 units on holidays. In total, the kiosks collected $354,329 in rental fees during the 11 major holidays proving self storage customers are active people in today’s fast-paced world that want to do business at their convenience. The pie chart to the left illustrates how customers pay when they use a kiosk. With all three forms of payment being used, the need for providing consumers with an on-site payment option that supports all forms of payment is a must and a competitive advantage. While credit cards are the preferred method of payment, checks and cash still make up the other half. OpenTech has developed a Success Guide of “Best Practices” to help self storage owners get the most value from their kiosk. By leveraging these proven best practices, the top 100 performing kiosks processed 77,258 total transactions alone; this includes rentals, payments and merchandise purchases. This group of kiosks also averaged 6.7 completed rentals per month. OpenTech Alliance, Inc. is the leading developer of innovative self-storage solutions. The company products and services include seven models of INSOMNIAC Kiosks ranging from $5,000 to $18,000, INSOMNIAC Live! call center services and the INSOMNIAC Self Storage Network for online storage reservations. OpenTech products and services improve customer convenience, reduce operating costs and increase revenues for self-storage facilities. For more information please visit www.opentechalliance.com or call (602) 749-9370. PHOENIX, Arizona – March 11th, 2009 – OpenTech Alliance, Inc., today announced that Herman & Kittle Properties, Inc. (HKP), the owners and managers of the Infinite Self Storage portfolio of 20 self storage properties in Indiana and Illinois, have purchased their 20th INSOMNIAC kiosk. Herman & Kittle Properties develop, build, and manage self storage facilities and affordable housing throughout the Midwest and South. From its headquarters in Indianapolis, the company is involved in more than 1.2M square feet of storage space and over 6,400 apartment homes in six states. PHOENIX, Arizona – January 24th, 2009– OpenTech Alliance, Inc. today announced it has exceeded the $15 million mark in rental fees collected by its INSOMNIAC kiosks. Self storage facilities around the globe obtained $8M of those fees collected in the past 12 months. In an ongoing effort to be a transparent company, OpenTech is releasing these detailed kiosk usage numbers giving the self storage industry the opportunity to see for itself how much consumers have utilized and benefited from the use of self service kiosks. OpenTech’s is currently creating a more detailed Kiosk Usage White Paper that is available upon request. Self storage owners have already purchased over 450 INSOMNIAC kiosks to date. OpenTech reported 196 kiosks were online as of January 1, 2008 and another 155 came online during the period ending December 31, 2008. During 2008, consumers used INSOMNIAC kiosks to rent 8,938 storage units, make 76,260 payments, and purchase 5,014 locks representing a total of $8,709,980 in self service transactions. One of the many benefits of a kiosk is that it does not need to take a holiday. 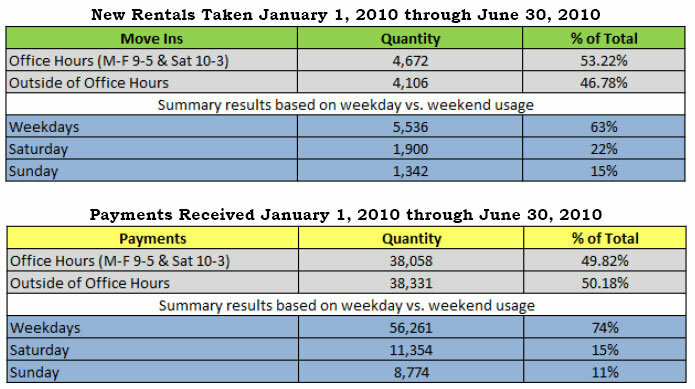 In 2008 INSOMNIAC kiosks rented 249 units to customers on holidays. In total the kiosks collected $254,155 in rental fees during the 11 major holidays proving self storage customers are active people in today’s high paced world that want to do business when it is most convenient for them. “INSOMNIAC kiosks can serve as a hedge against increasing expenses in this tough economic climate. The kiosks give self storage owners the ability to reduce their staffing expense without sacrificing new rentals or customer service” said Robert Chiti President and CEO of OpenTech Alliance. With all three forms of payment being used the need for providing consumers with an on premise payment system that supports all forms of payment is a must. While credit cards are the preferred method of payment checks and cash still provide for the other half. 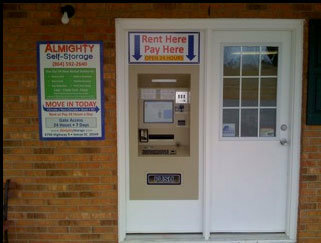 OpenTech Alliance, Inc. is the leading developer of self-storage kiosks. Its INSOMNIAC line of self-storage kiosks improves customer convenience, reduces operating costs and increases revenues for self-storage facilities. For more information or to see an online demo, please visit www.opentechalliance.com or call (602) 749-9370. 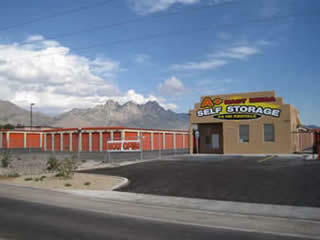 PHOENIX, Arizona – November, 18th 2008 – OpenTech Alliance, Inc., today announced that the owner of Self Storage of America has been successfully operating his 1100 unit facility in Indianapolis for over 2 years with one off site property manager and an INSOMNIAC 500, OpenTech’s lowest priced rental kiosk. The payroll savings of using the kiosk as the part time manager more than paid for the kiosk investment in less than 12 months, while the significant amount of incremental rentals went straight to the bottom line. The kiosk has rented over 290 units in the past 24 months averaging 12 rentals a month and collecting over $255,778 in rental fees. At $11,000 the INSOMNIAC 500 is OpenTech’s lowest priced rental kiosk. It is outfitted with many great features, a built in bright 15” touch screen, digital video camera, credit card reader, check reader, bill acceptor to validate and record currency denominations from $1 to $100, 1 tray lock dispenser that dispenses 7 locks. It shares the same chassis as the 700, so it can be upgraded later on if the need arises and fits almost anywhere thanks to its accommodating size and installation options. The 500 uses the same open technology platform as all INSOMNIACs, meaning it connects seamlessly with all property management software’s provided by our Alliance Partners and can work side-by-side with other INSOMNIAC models. Looks may be deceiving, but there’s no denying the 500 will improve your bottom line while providing your customers with a new level of convenience. Self Storage of America is located at 7339 E Washington St. Indianapolis, IN. For more information, please call (317) 322-7867. 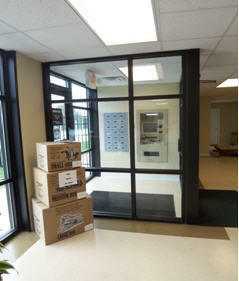 OpenTech Alliance, Inc. is the leading developer of self-storage kiosks. OpenTech’s INSOMNIAC kiosks enable customers to rent units, make payments, purchase locks, and update their accounts 24 hours a day on their own without a manager’s assistance. For more information about OpenTech, please visit www.opentechalliance.com or call (602) 749-9370. PHOENIX, Arizona –September 03, 2008– OpenTech Alliance, Inc. today announced it has exceeded the $11 million mark in rental fees collected by its INSOMNIAC kiosks at their client’s self storage facilities across North America, with the most recent $1 million dollars in revenue being collected in June. In an ongoing effort to become a transparent company, OpenTech released detailed kiosk usage numbers for the first six months of 2008, giving the self storage industry the opportunity to see for themselves how much consumers utilize and benefit from the use of self service kiosks. Self storage owners have already purchased over 400 INSOMNIAC kiosks to date. OpenTech reported 206 kiosks were online as of January 1, 2008 and another 56 came online during the period ending June 30, 2008. For the first half of 2008, consumers used INSOMNIAC kiosks to rent 3,925 storage units, make 31,984 payments, and purchase 1,456 locks, representing a total of $ 3,719,772 in self service transactions. 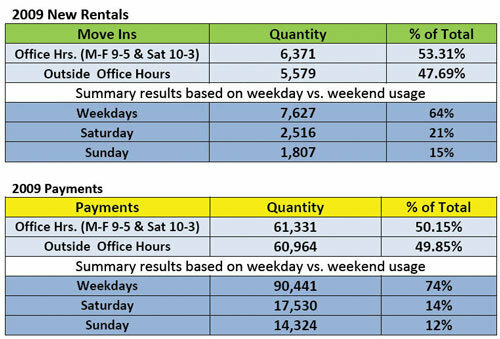 “The data clearly shows a high percentage of kiosk use during operating hours, which affirms my contention that while the human touch is great, many renters will use technology to execute a transaction, both from a rental and payment processing perspective. The reduced costs associated with a machine versus an employee are significant; a kiosk does not take a day off, very rarely calls in sick, and never presents a life safety issue when dealing with cash” said RK Kliebenstein Leader of Coast-To-Coast Storage. Currently in 2008, 48% of moves ins and payments took place outside of office hours. This proves there is a tremendous opportunity for storage owners to acquire more customers by being open for business outside of regular office hours. The other 52% of kiosk usage occurred during regular office hours. This clearly shows the kiosks complement on-site managers and demonstrates that customers are comfortable using self-service technology. Credit cards are the preferred method of payments at the kiosk. However, the use of cash and checks represents over 50% in total payments made at the kiosk. With all three forms being used a great deal the need for providing consumers with an on premise payment system that supports all three forms of payment is a must. OpenTech Alliance, Inc. is the leading developer of self-storage kiosks. Its INSOMNIAC line of self-storage kiosks reduce operating costs, increase revenue, and drastically improve customer service for self-storage facilities. For more information or to see an online demo, please visit www.opentechalliance.com or call (602) 749-9370. A Remotely ran facility has never been so convenient! PHOENIX, Arizona –August 14, 2008 – OpenTech Alliance, Inc., announced today that one of their valued customers, Casey Storage Solutions, has purchased three additional kiosks, two 900s and one 700 for their self-storage facilities in Massachusetts and Southern Vermont. In the fall of 2007 Casey Storage Solutions purchased and implemented their first INSOMNIAC 700 kiosk at their Sturbridge, Massachusetts store. Their goal was to manage the 40,000 square foot store remotely from their much larger store 12 miles away allowing the company to reduce operating expenses without sacrificing the company’s goal of providing their customers with the best self-storage experience possible. The INSOMNIAC kiosk’s built-in security features provide the customer and self-storage owner with the confidence that a room rental or other transaction will be processed securely. During the rental process, the kiosk collects a customer’s billing information, scans their driver’s license, takes their photo, and captures their fingerprint and signature for the rental agreement. The kiosk also provides customers the convenience of accepting all forms of payments (cash, check or credit card). 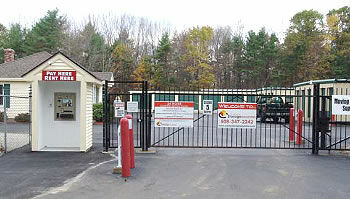 Casey Storage Solutions operates six self-storage stores in Central and Western Massachusetts and Southern Vermont. Their self-storage stores provide amenities such as climate controlled storage, video surveillance, and business services. 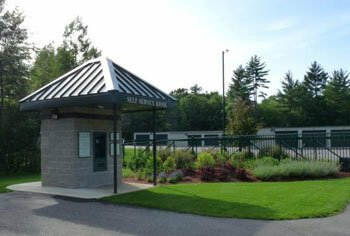 For more information about Casey Storage Solutions, please visit www.caseystoragesolutions.com or call (508) 832-2425. What do Santa and INSOMNIAC Have in Common? PHOENIX, Arizona – January 8, 2007 – OpenTech Alliance, Inc., today announced INSOMNIAC™ kiosks across North America were busier than Santa’s elves during the holidays. From December 25, 2006 through January 1, 2007, INSOMNIACs processed over $95,000 worth of transactions. Of the 944 transactions, 92 were new rentals. Brooks Olson, owner of University Storage in Washington, found INSOMNIAC was the gift that keeps on giving. Mr. Olson emailed to say, “We are thrilled with the performance of our first kiosk! Our vacancy has never been this low.” Mr. Olson has already purchased his second INSOMNIAC kiosk and expects to have it operational within the next month. OpenTech Alliance, Inc. is the leading developer of self-storage kiosks. Its impressive INSOMNIAC line of self-storage kiosks improves customer convenience, reduces operating costs and increases revenues for self-storage facilities. For more information about OpenTech or its INSOMNIAC kiosks, please visit www.opentechalliance.com or call (602) 749-9370. ABOUT THIS EMAIL: As a self-storage professional, OpenTech believes this news release is of interest to you. If you do not wish to receive OpenTech press releases in the future, simply give us a call or reply to this email with “REMOVE” in the subject.